206 in stock Need More ? Board book With electronic sounds. Press the sound button to hear Santa sneeze!This fun-filled festive sound book, based on the popular Christmas song, will delight children as they follow Santa on his Christmas Eve journey. There's just one problem... he's a little bit stuck! 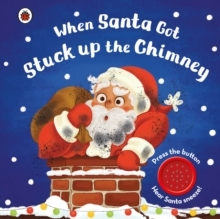 Will he ever make it out of the chimney to deliver the rest of the presents in time for Christmas Day?